The idea of a collective European defence is as old as the story of European integration itself. From thet ashes of World War 2, it wouldn’t take long to see an incredible idea emerge : what if European countries, busy stitching their wounds after half a decade of devastating conflict, could start cooperating on defence issues and promote peace together ? Iconoclastic as it sounded at the time, the idea was nevertheless at the heart of some of the very first post-WW2 treaties that were drafted to banish any possibility of war from the continent. In March 1947, a Treaty of “Alliance and Mutual Assistance” was signed in Dunkirk by France and the United Kingdom. The two countries vowed to “cooperate closely with one another as well as with the other United Nations in preserving peace and resisting aggression”, in a move that was primarily aimed to prevent any possible future German aggression in Europe. The following year, in March 1948, the signature of the Treaty of Brussels saw the extension of this initial effort to three additional countries : Belgium, Luxembourg, and the Netherlands. The signatories made their intent even clearer. Stating that this Treaty was meant to “afford assistance to each other [...] in maintaining international peace and security and in resisting any policy of aggression”, they summarised their alliance as one for “collaboration in economic, social and cultural matters, and for collective self-defence”. These first small steps towards European defence cooperation were soon to be overshadowed by a much more ambitious endeavour. In the summer of 1950, Jean Monnet, then General Commissioner of the French National Planning Board, expressed his will to organise European defence on a supranational basis, an initiative inspired by French foreign minister Robert Schuman’s plan for establishing the European Coal and Steel Community (ECSC) that would eventually come into effect in 1952. At the same time, the United States of America were also asking their European allies to plan for the rearmament of West Germany. The proposal for what was known as the European Defence Community (EDC) was submitted by French Prime Minister René Pleven to the National Assembly in October 1950. It called for the creation of a European Army to be placed under supranational authority and to be funded by a common budget. A European armament and equipment pro- gramme would be drawn up and carried out under the authority of a European Defence Minister, who in turn would operate under a European Defence Council. The ambitious idea was supported by most Western countries. The initial Pleven plan called for integration of France, West Germany, Italy, and the Benelux countries into the EDC, but the initiative also drew support from the United Kingdom and the USA after modifications were made to the initial proposal, especially regarding the introduction of German units into the future European Army. The EDC Treaty was signed in May 1952 by Belgium, France, Germany, Italy, Luxembourg, and the Netherlands. Dwight D. Eisenhower, then NATO’s Supreme Allied Commander Europe (SACEUR), supported the EDC project as an effective way to maximise European military potential. Although sceptical at first, the United Kingdom eventually gave its agreement to the initiative. “Her Majesty’s Government in the United Kingdom of Great Britain and Northern Ireland believe that the European Defence Community will be an essential factor in strengthening the defence of the free world through the North Atlantic Treaty Organisation, and desire to establish the closest partnership with it”, stated an official British statement in April 1954, adding that “the United Kingdom will also join in developing a common policy in technical fields such as training, tactical doctrine, staff methods, logistics, and standardisation of equipment”. However, a devastating blow was dealt to the European Defence Community in August 1954 when the French National Assembly rejected the Treaty, refusing even to discuss the matter. France’s position was met with considerable consternation in Western Europe and the United States, not least because this rejection came from the very architects of the EDC plan. Over the next decades European integration in defence would take place primarily in the framework of NATO. In 1954, the North Atlantic Council formally approved the accession of the Federal Republic of Germany to the North Atlantic Treaty Organisation, finally settling the difficult question of Germany’s rearmament in the post-WW2 environment. In 1954, the original 1948 Treaty of Brussels was modified in order to allow for introduction of West Germany and Italy into the original five-member club. This effectively led to the creation of the Western European Union (WEU), an organisation which would play a small yet tangible role in shaping European Defence throughout the Cold War era. Involved in debates in the late 1950’s and early 1960’s regarding the presence of nuclear weapons on European soil, the WEU also played the role of a liaison between the United Kingdom and European institutions until London decided to join the European Community in 1973. But the major influence of NATO in defence and security matters in Europe meant that the WEU would be eclipsed to the detriment of a true European dimension of defence in the first decades of the Cold War. A number of bilateral efforts aimed at strengthening the European defence industry were also launched in that period. Signed in 1963 by France and West Germany, the Elysée Treaty marked a tangible will for cooperation in the armament domain. More than a decade after the failed attempt to launch the European Defence Community, Paris and Bonn used their political strength to kick-start an ambitious partnership between the two countries’ defence industries. Called Euromissile, the initiative aimed to develop new anti-tank guided missiles as well as air defence systems that would equip both nations’ armed forces. This political effort gave birth to the Milan and Hot combat missiles, as well as the short-range air defence Roland system. However, it eventually failed to establish an interdependent missile industry across both banks of the Rhine. Similar projects were undertaken in other domains, such as the Anglo-French SEPECAT Jaguar tactical strike aircraft that entered service in the Royal Air Force and the Armée de l’Air, but this was again a purely bilateral initiative. However, it wouldn’t take long for some European nations to realise that future cooperative defence programmes might demand a shift from strong management by a single government to some sort of joint project control. Founded in February 1976 by the European members of NATO, the Independent European Program Group (IEPG) was envisioned as an international coordinating body whose main mission would be to foster cooperation on armaments procurement. Using the IEPG as a forum for annual discussions, the defence ministers of the 13 member nations (all European members of NATO, except Iceland) set out goals and targets in the field of military requirements, system concepts, and collaboration. Their objectives were three-fold : to strengthen the contribution of European allies to the common defence of the NATO alliance ; to improve the European technological base ; and to balance US-European defence trade. The IEPG set out to conduct a number of studies, such as the European Aeronautical Cooperation Study and the European Defence Industry Study. The fall of the Soviet Union and the return of the Warsaw Pact countries to the European fold raised new questions about the purpose and direction of defence in Europe. This was compounded by the eruption of a crisis in Europe’s direct neighbourhood. In 1991, with Yugoslavia on the verge of imploding, Luxembourg’s Foreign Minister Jacques Poos declared that “the hour of Europe has struck.” However, instead of providing a coordinated and effective response, the Balkan crisis exposed both a lack of cooperation and a lack of relevant military capabilities in Europe. What was effectively a European crisis was only resolved by NATO and, principally, US action. The declaration agreed by Western European Union Ministers in Maastricht on 10 December 1991 called for further examination of the possibilities for enhanced cooperation in the field of armaments, with the aim of creating a European Armaments Agency. At their meeting in Bonn in December 1992, the Defence Ministers of the 13 IEPG countries decided upon the transfer of the functions of the IEPG to the WEU, while agreeing on a set of principles for this transfer : all 13 nations should be entitled to participate fully with the same rights and responsibilities in any European armaments cooperation forum ; there should be a single European armaments cooperation forum ; armaments cooperation in Europe should be managed by the National Armaments Directors of all 13 nations, who will be accountable to the Ministers of Defence of those governments. They also agreed to maintain links with the European Defence Industries Group, or EDIG, set up in Brussels in 1990 as an international association drawing its membership from all the national defence industry associations of the WEU. At the meeting of the WEU Council of Ministers in Rome in May 1993, participants agreed on a number of organisational aspects of the transfer, which were subsequently adopted formally by the Council. The Western European Armaments Group (WEAG) was born. Growing to 19 Member States by 2000 (Austria, Belgium, Czech Republic, Denmark, Finland, France, Germany, Greece, Hungar y, Italy, Luxembourg, Netherlands, Norway, Poland, Portugal, Spain, Sweden, Turkey and the United Kingdom), it would live on until 2005. Among its objectives, the Group sought to strengthen the European defence technological and industrial base while making more efficient use of resources, for instance through an increased harmonisation of requirements. As early as 1993, the WEAG created an ad hoc study group to “examine all matters related to the possible creation of a European Armaments Agency”, or EAA. This stemmed from a WEU Maastricht declaration following the 1992 Treaty that spoke of a requirement to examine further proposals for enhanced cooperation in the field of armaments, with the aim of creating a European armaments agency. A number of missions considered potentially suitable for such an agency were identified, and the work of this ad hoc study group contributed to the agreement by defence ministers in November 1996 to establish the Western European Armaments Organisation (WEAO) as a WEU subsidiary body. The view that a new Europe needed a new approach to foreign and security policy was made clear in the series of treaties signed over the next two decades. Firstly, in 1992 the Treaty of Maastricht created the Common Foreign and Security Policy (CFSP), which would deal with all questions relating to the security of the Union, “including the eventual framing of a common defence policy, which might in time lead to a common defence”. The CFSP was further reinforced in 1997 when the Amsterdam Treaty incorporated the Petersberg Tasks into the policy, outlining the areas and ways in which EU Member State’s militaries could be used through the policy. This effectively opened the way for the WEU to be integrated into the European Union. In the same year, during a meeting in Erfurt, WEAG ministers discussed European armaments cooperation could be enhanced through a dedicated agency ; they worked on a “Masterplan for the European Armaments Agency” that was eventually approved in Rome in November 1998 by Ministers as a basis for further development. Meanwhile, a few European countries kept experimenting with new ways to strengthen their defence industry in the face of shrinking budgets and US competition in export markets. On 6 July 1998, six nations (France, Germany, Italy, Spain, Sweden, and the United Kingdom) signed a Letter of Intent (LoI), concerning “Measures to Facilitate the Restructuring of European Defence Industry”, with a Framework Agreement signed in 2000 and ratified in 2001. This inter-governmental treaty, signed outside of the European Union framework, was nevertheless another example of increased European cooperation in the armaments field. The LoI’s declared objective was to tackle a number of hot topics that were deemed crucial for the future of Europe’s defence industry: security of supply ; export procedures ; security of information ; research and technology ; intellectual property rights ; harmonisation of military requirements. The overarching goal was to create the political and legal framework necessary to facilitate industrial restructuring in order to promote a more competitive and robust European Defence Technological and Industrial Base, or EDTIB. An Executive Committee of senior officials was established, with each LoI nation chairing it in turn on an annual basis and meeting several times a year to assess the progress being made. At the same time, European nations were still trying to gather their efforts in order to enhance efficiency in the armament domain. In December 1995, France and Germany decided to move for ward together by putting in place new cooperation rules, known as the Baden-Baden agreements. This first Franco-German framework soon attracted interest from Italy and the United Kingdom and based on these principles, they went on to set up the Organisation Conjointe de Coopération en matière d’ARmement, or OCCAR, established by an administrative arrangement on 12 November 1996. Its aim was to provide “more effective and efficient arrangements for the management of certain existing and future cooperative armament programmes”. The Defence Ministers of the founding nations then signed a treaty, the “OCCAR Convention”, that came into force in January 2001. The organisation would later be joined by Belgium and Spain. 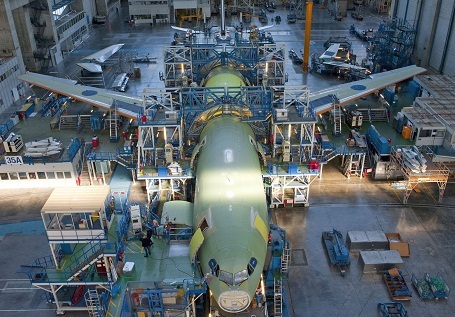 For the following years, the main mission of OCCAR would be to manage the A400M program, which would take up the large majority of the organisation’s resources. Other programs such as the FSAF family of surface-to-air missiles, the FREMM frigate or the Tiger helicopter would also end up being managed by the multinational organisation. The political push for Europe to fulfil its role on the global stage, including defence and security issues, gained extra momentum with the joint UK-French declaration of Saint-Malo in December 1998, only a few weeks after the first informal meeting of EU Ministers of Defence in Pörtschach, Austria. In Saint-Malo, the French President and UK Prime Minister jointly called for a European foreign policy that would allow Europe to play its full role on the international stage. To achieve this, they argued that the EU must have the capacity for autonomous action, backed by credible military forces, to respond to international crises. This view was endorsed by the other Member States at the European Council in Cologne, 1999, which declared that the EU needed to be given the means and capabilities to assume its responsibilities for a common European policy on security and defence. This initiative was to be pushed by Javier Solana, who became the first Secretary General of the Council and High Representative for Common Foreign and Security Policy of the European Union in 1999. While in the same year, Member States agreed to a set of military capability targets to be completed by 2003, known as the Helsinki Headline Goal. The following year brought further progress in the establishment of an effective EU foreign and security policy, with the agreement to permanently establish the Political and Security Committee (PSC), EU Military Committee (EUMC), and EU Military Staff (EUMS).